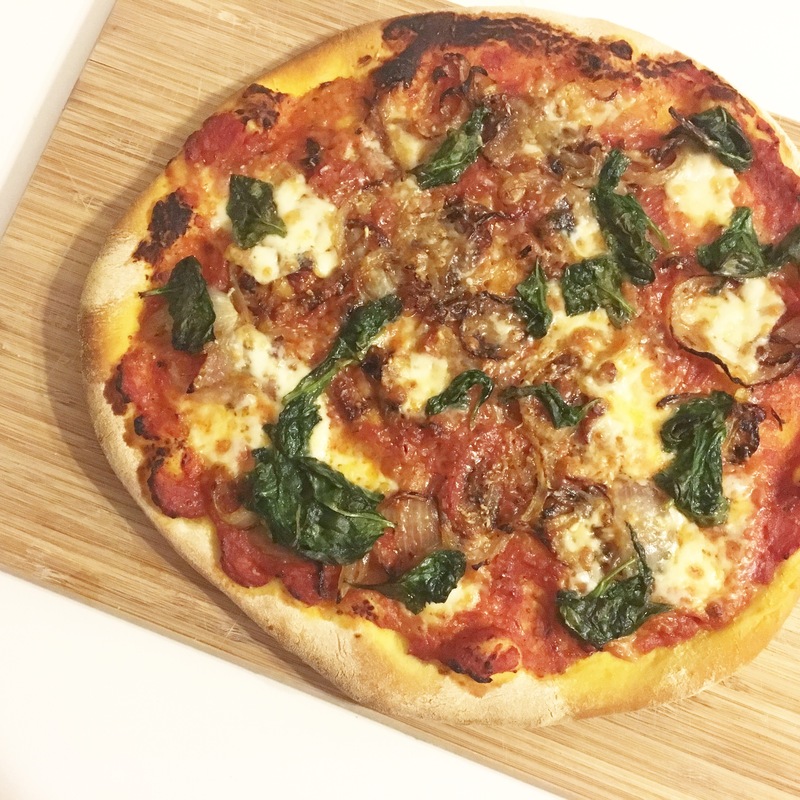 I used Jamie Oliver’s recipe for pizza dough and it worked an absolute treat. The original is here. Best part is, it makes six large pizza bases and you only need to use two – so freeze the other four and have pizza another day! I use a food processor with a dough hook to make mine, so here’s the method I used, but if you want to make it by hand, click on the link to follow Jamie’s method. Place the white bread flour with 1 tsp sea salt into the bowl of your processor with the dough hook, and mix roughly. In a jug, combine the yeast, sugar and 4 tbsp of olive oil with 650ml of lukewarm water. Leave until it starts to bubble, maybe five minutes. Knock the dough back and weigh it, then divide it equally into six parts. Wrap four carefully with clingfilm and freeze individually in the freezer until needed. Roll out your two bases with a rolling pin until they’re around 0.5cm thick. Transfer them onto oiled pieces of foil, and turn your oven up as high as it’ll go, and place in your baking sheet(s). Now you can start on your toppings! Add a small slug of olive oil to a frying pan and start the lardons frying. Give them a couple of minutes to start releasing flavour, and then add the onion. Cook until soft and only just starting to colour. Remove from the heat and place in a bowl. Now add your spinach and wilt, and remove from the pan when done. Finally, add a bit more olive oil (a couple of teaspoons) and chuck in the crushed garlic if you’re using it. Fry until you can smell that garlic aroma, then pour in your tomatoes and some oregano if using. Reduce well until the mix is nearly dry, then add a pinch of sugar if using, and season to taste. Top your pizzas sparingly with the sauce, then add the bacon and onions, and dot over the spinach leaves. Now break the mozzarella with your fingers into small pieces and dot those around too. If you have any, grate some parmesan over the top, and optionally drizzle a bit more olive oil over. Slide your pizza onto the pre-heated baking trays and cook for around ten minutes, or until golden and bubbling. Total cost – £1.68, plus four extra portions of pizza dough, just waiting to be defrosted in the freezer.